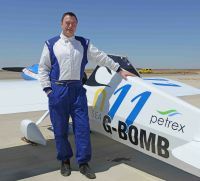 On the outskirts of the quiet town of Lleida, in the heart of Spain’s Catalunya region, June saw the launch of an exciting new aerial motor sport event as Europe’s first ever Air Race F1 competition took place above the expansive agricultural landscape. Air Race F1 had arrived in Europe for the first time and delivered to the crowd of some 10,000 people at Lleida-Alguaire Airport one of the summer’s most exciting new spectator events. A field of 11 international competitors battled it out to be crowned Air Race F1 champion. Unlike Red Bull air racing which focuses on timed circuits and aerobatics, this new competition consists of Formula 1 class aeroplanes, often based on the classic Cassutt model, competing directly against each other in the skies at speeds of up to 400kph around a virtual aerial circuit of 2km end to end. The aircraft are a specific class, which sets strict parameters regarding wing area, engine size, height of cockpit and other design characteristics. Following qualifying heats the aircraft lined up on the runway grid, with up to eight aircraft taking off at the same time. The brave maximise the opportunity to overtake rivals during take-off; then once in the air the race turns into one of speed and strategy. Competitors speed around an oval circuit marked by ground-based pylons, for up to 15 minutes at a time. Flying heights rarely rise above 200ft unless strategy requires a height increase to facilitate an overtaking dive on the curve of a corner for example. Speeds at this month’s event averaged 384kph. From the ground the sport is breath-taking, edge of the seat stuff, as the planes seem to come within wing clipping distance of each other in their pursuit of podium positions. An informal poll the night before the main event suggested that even veteran racers believed Guille was going to be the champion. However the jovial atmosphere of the pre-race party dissolved on the apron as race preparations began. 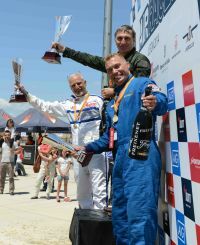 Veteran pilots with backgrounds in aviation, the military and aviation design displayed focus, in addition to nerves, in the race build up which led to a close race with Guilie taking the win ahead of Jones and Sweden’s Thom Richard. While his rivals’ experience and manoeuvrability was arguably stronger it was the Frenchman’s use of energy and speed that was the deciding factor – he seemed untouchable in the skies as he sped round the circuit. Obviously safety is a key consideration in hosting the events but Jeff Zaltman the CEO of Air Race F1 has had many years of experience and in conjunction with representatives of the world’s three main F1 sanctioning bodies, the US International Formula One Association (IF1), the French Association des Pilotes d’Avions de Formules (APAF) and the UK’s Formula Air Racing Association (FARA), worked hard to ensure the race was both safe and a monumental success for all involved.